Dr Jengo's World: Even more Stuff from SDCC 2013! Of course I'm not done yet with SDCC! Remember that pic that was hiding behind the Edward Kenway statue? Well, a better pic has been found by Lily again from the CE forums. Thought it has been revealed that one of the 2 secret pirates is Benjamin Hornigold and the other is expected to be Black Bart, both of whom are real-life legendary pirates. Another figure that was shown before is Connor in his New York Outfit. The Blackbeard figure seems to be exclusive to the Pirate 3-Pack though. All the weapon accessories are also shown so buyers will have a vast range of weapons to choose from. 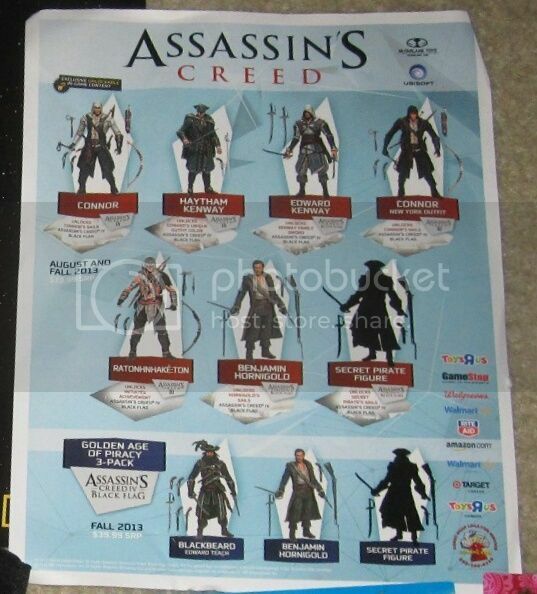 Looks pretty good so far, hoping they sell well enough to warrant more Assassin figures, including those from the older games and even the comics. Witchblade has been announced to feature in The Darkness movie! I have yet to play the Darkness games but I have started on the comics already and it's really good. Would love to catch the movie when it's out! That's all from SDCC 2013 guys, you can check out my previous SDCC-related posts here. Unless I missed something, that's all the stuff that interests me from this year's SDCC. Quite a lot actually, just added quite a number of stuff to my wish-list!